As you press TickleFLEX against your skin the highly textured fingers tickle the skin, saturating the local nerves to mask any pain. It’s like scratching an itch or rubbing an ache. As the needle enters, the fingers gently gather a small fold of subcutaneous tissue helping to direct the insulin to where it is intended. 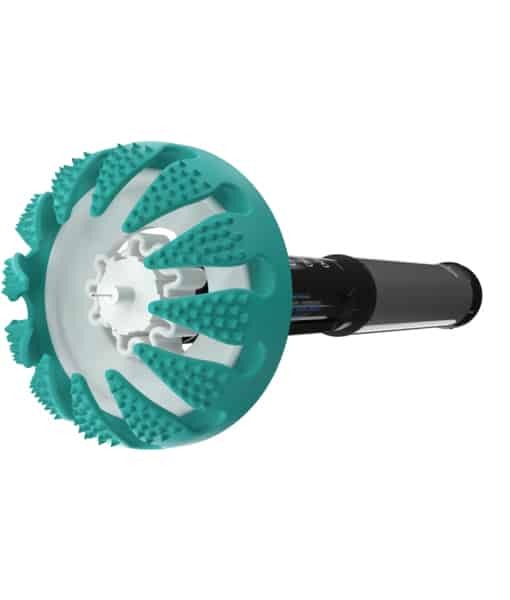 As TickleFLEX gathers, it secures itself against the skin, preventing needle shear as a result of an unsteady hand. Is TickleFLEX suitable for every member of my family? Yes, TickleFLEX is equally effective on babies, toddlers, children and adults. Sometimes insulin leaks on to my skin, what am I doing wrong? You are not pressing TickleFLEX firmly enough against your skin, therefore the needle is not going in deep enough and the insulin is leaking out. It is important to make sure you press and hold TickleFLEX fully and flat against your skin. DON’T WORRY, the circular pad prevents you from going into deep. For more information please go to our instructions for use section on the Home Page. How can I get to see the needle when I inject? Simply cut a finger off with a pair of scissors from your TickleFLEX to create a side viewing window. TickleFLEX will still works as intended, and you get the benefit of visibly seeing the needle. 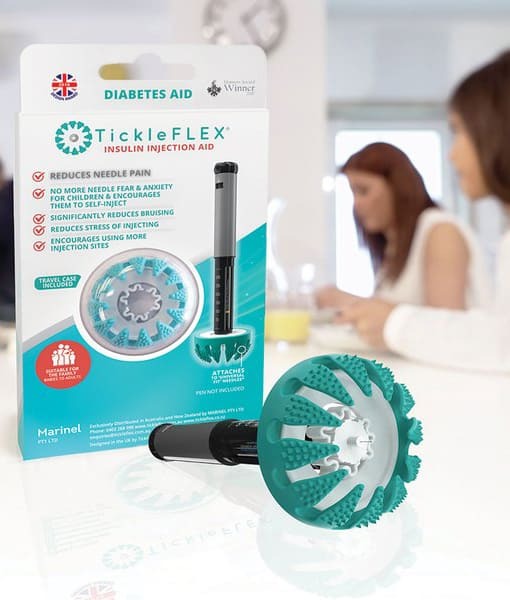 Does TickleFLEX fit all needles? 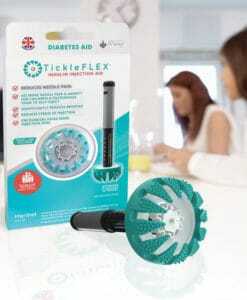 TickleFLEX attaches to universal fit needles for standard insulin pens. It does not fit the Toujeo Solostar pens or work with safety needles. How can I keep my TickleFLEX clean? TickleFLEX is very durable. It can be placed in boiling water without causing it any damage. It can also be washed with a mild soap and warm water solution. Do I need to store TickleFLEX in its case? The TickleFLEX travel case is constructed from UV Opaque Polycarbonate to protect your TickleFLEX from UV light that can discolour the silicon; Dust / Insects; Getting accidentally crushed and distorted. Does it need to be stored in a cool place? No. Silicon holds its shape even when hot, that’s why it’s also used for kitchen utensils. How long will TickleFLEX last? We advise you to change your TickleFLEX every 12 months or when you notice wear and tear on the textured fingers or the shape becomes distorted. 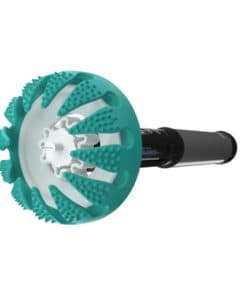 Does TickleFLEX need to be used at 90 degrees to the skin? It helps, but it will be OK at modest angles. You can compensate by pressing a little harder.